Rockets fired from northern Syria have killed four Syrians, three of them children, in the Turkish border town of Kilis, local officials say. The five Katyusha rockets came from part of Syria controlled by Islamic State (IS) militants, the Kilis governor's office said. Turkish artillery fired back at IS positions across the border, Turkey's Hurriyet news daily reported. Kilis has a Syrian refugee camp and shells have landed from Syria before. Four of the rockets hit residential areas of Kilis - a town where an estimated 120,000 Syrian refugees outnumber local Turks. 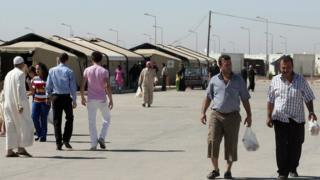 A Turkish citizen and five other Syrians were also wounded in the rocket fire. Cross-border artillery fire has hit Kilis almost daily recently. Twelve people were wounded there on 11 April, then the following day two people were killed and six wounded in a similar strike, Hurriyet reported.